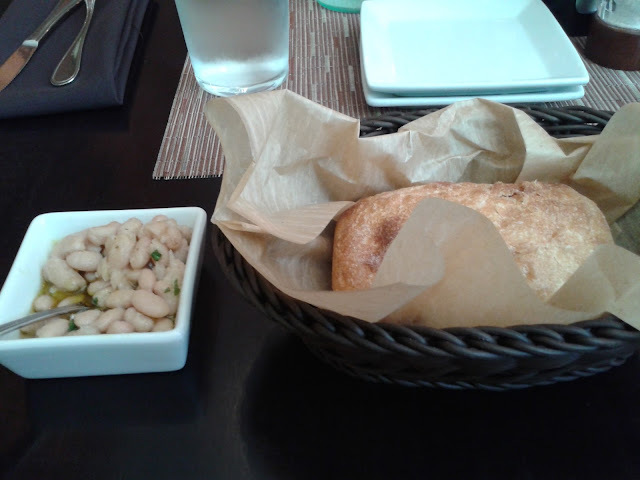 About a week and a half ago, I saw a post on Facebook about Aria Tuscan Grill offering an "Express Lunch" on weekdays. I'm noticing more upscale restaurants in Charlotte, particularly in Uptown, offering these express or quick lunches as a way to attract patrons and to convey to them that the restaurant will serve them in a timely manner befitting of their typical one-hour lunch break. But another thing that was intriguing about Aria's express lunch is that it offers three courses for $8.99. So, Andrea and I made plans to go to lunch Friday and I figured it would be a good opportunity to check out Aria. I've been there a a handful of times--including its grand opening in January 2010--but this was my first time going to Aria for lunch. I'll tell you, they've perfected the express lunch. First off, the hostess greeted and seated us immediately upon entering. And within a minute or two, a waitress was taking our drink order. The express lunch menu is inserted onto the top of the full menu. For the three courses, you can choose one of two salads, one of four pasta dishes, and the third course is one option for dessert. By narrowing the selections, it ensures that the wait staff and kitchen staff can get your food out quickly. We placed our orders, and almost immediately after another server brought out the complimentary bread and olive oil with beans. Our lunch was brought out six minutes after placing the order. I've never been served so quickly at this type of restaurant. And it was delicious. 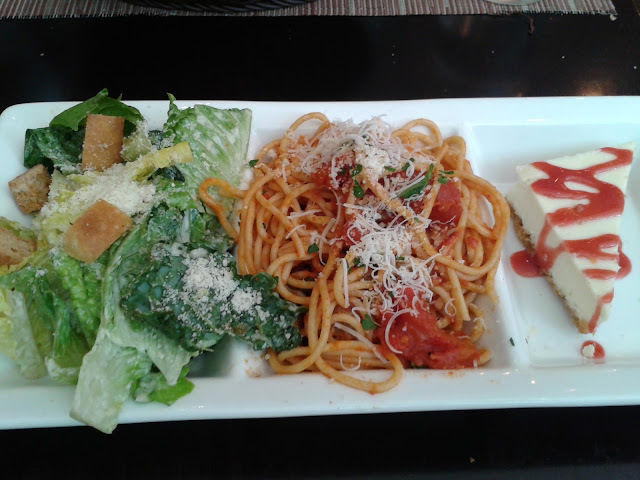 I had the Caesar salad, spaghetti and meatballs, and cheesecake. Yes, they're smaller than the portions you might be used to, but the fact that it's three courses makes it filling. And again, it's only costing you $8.99. You'll spend that at the local burger joint. 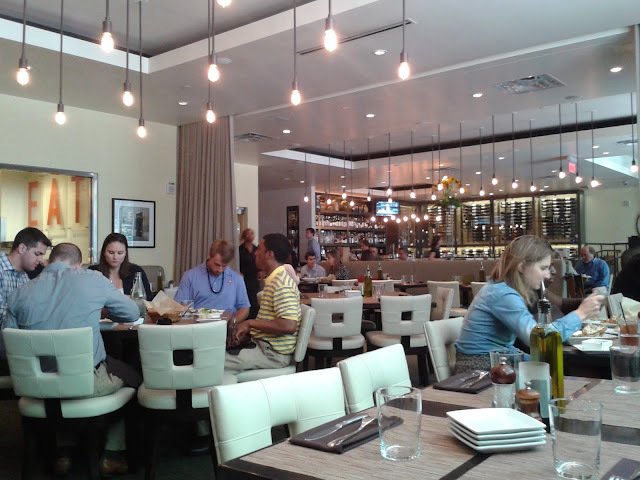 I certainly recommend eating at Aria for lunch, especially if you work or are meeting in Uptown. And if you don't want to spend half your time waiting. (The regular lunch menu is available too, of course). Aria Tuscan Grill, at Founders Hall, 100 N. Tryon St., 704-376-8880, ariacharlotte.com.